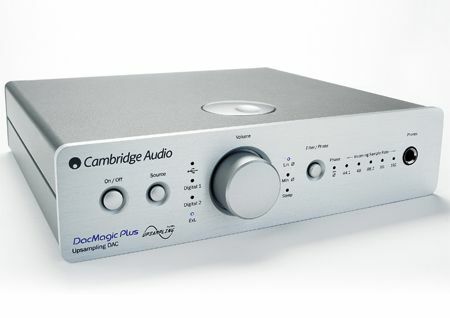 Cambridge Audio DacMagic Plus review | What Hi-Fi? Cambridge Audio's original DacMagic was something of a whirlwind success. It was perfectly placed as the digital-to-analogue converter – that's a DAC to the uninitiated – re-emerged as a popular way to give your digital system a sonic boost. The original DacMagic continues for now but will be replaced by a new model in the near future. This model sits above it in price and spec. The volume control on the front points to the fact that this can now also work as a headphone amp or digital preamp. There's no remote, though; most folk will probably use this as a DAC, in which case the amp or computer will do that job. Also new is the ability to add the BT100 Bluetooth dongle (£70) for wireless playback from any Bluetooth device supporting the superior aptX codec. The DacMagicPlus now internally upsamples any connected source to 24bit/384kHz and has improved jitter reduction. It can accept 24bit/192kHz audio via its USB input, too – a quality that's rare over USB for DACs. There are RCA and balanced XLR outputs, twin digital coaxial and optical inputs, and also digital coaxial and optical outputs. There's a choice of Linear Phase, Minimum Phase and Steep filter modes, which you should experiment with, too (we liked Minimum the best). We started with some 24bit/192kHz files courtesy of our reference streamer via the coaxial input. R.E.M. 's Losing My Religion sounds detailed and fast. It's light on its feet and capable of impressive subtlety in both voices and instruments. Switch to the USB connection and Amy Winehouse's Valerie ('68 version) from the Lioness: Hidden Treasures album, there's not the weight or refinement we get from our reference Arcam rDAC. It does deliver plenty of detail and agility, but we do miss out on a bit of power. Voices, meanwhile, are clean and natural but do veer towards the bright side when really pushed. That brightness is apparent when using the headphone amp, too. Plug in your cans and the volume control, which can be disabled, kicks into life. The sound is detailed and clear but there is an edge to the treble, despite plenty of running-in. If you want to go wireless, there is an inevitable drop in quality – but the aptX dongle connected to our smartphones and laptop easily enough, and sounded better than standard Bluetooth connections. Is it a jump in performance on the original? Yes. It sounds better and does more, and if you value the extra features then the DacMagic Plus could be ideal. But you have to pay for it, and with impressive competition, the DacMagic Plus is in 'very good' (but not class-leading) territory.